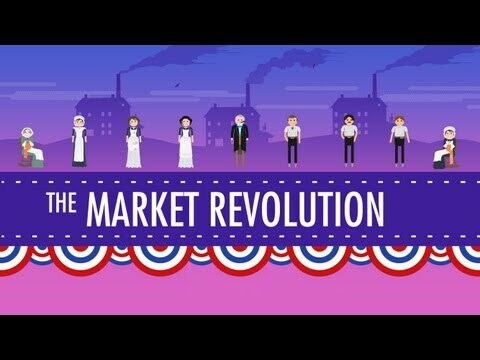 When did the Market Revolution take place? What did many people move away from in the early 1800's? According to this video, did Hamilton or Jefferson win? What allowed for this massive shift (people moving from producing for themselves to producing for others)? What was more important at this time, roads or canals? What made New York the US's premier port? In terms of the long-term impact, which transportation innovation was most important? What was the most important innovation of the time? What innovation allowed factories to be built in the midwest and not next to waterways? In both cases, what did the Supreme Court encourage? What happened after the Market Revolution, more people went to work or stayed home to work? What is the textile industry? Many factory owners had a hard time finding workers, who did they find to fill those jobs? What did 'Working Men's Parties' do? Which group of people lost freedom because of the Market Revolution?